These brownie-cookie creations using brownie mix and chocolate chip cookie mix are quick and easy to fix. A hit with kids and grown-ups alike, you’ll always want to keep the ingredients around for a hot-from-the-oven treat for guests. Like my last recipe Chocolate Waffles, Brookies work well for a book club or readers’ group get-together, family party, or any other fun gathering. 1- Preheat oven to 350º F. Spray 30 cupcake tin cups VERY WELL with a vegetable spray like Pam or grease-well. 2- Make Brownies according to directions on package in a bowl. 3- In another bowl, make Chocolate Chip Cookies according to directions on package. 4- Divide the Brownie batter evenly between the 30 cupcake tin cups. 5- Put a scoop of Chocolate Chip Cookie batter in the center of each Brownie-filled cupcake tin cup, making sure to use all the cookie batter. 6- Bake for 12-17 minutes (depends on your oven & mixes used). Watch the Brookies. They’re done when the cookie batter in the center is lightly browned. 7- Remove cupcake tins from oven. Cool briefly. Remove Brookies from tins with a clean knife. 8- Serve warm or cold, with or without ice cream. Keep leftover Brookies in an air-tight container. Brookies also freeze well. 1- Again, make sure your cupcake tin cups are well-oiled, well-greased, or well-sprayed with a vegetable cooking spray (like Pam). Brookies will stick to the pan if you don’t. 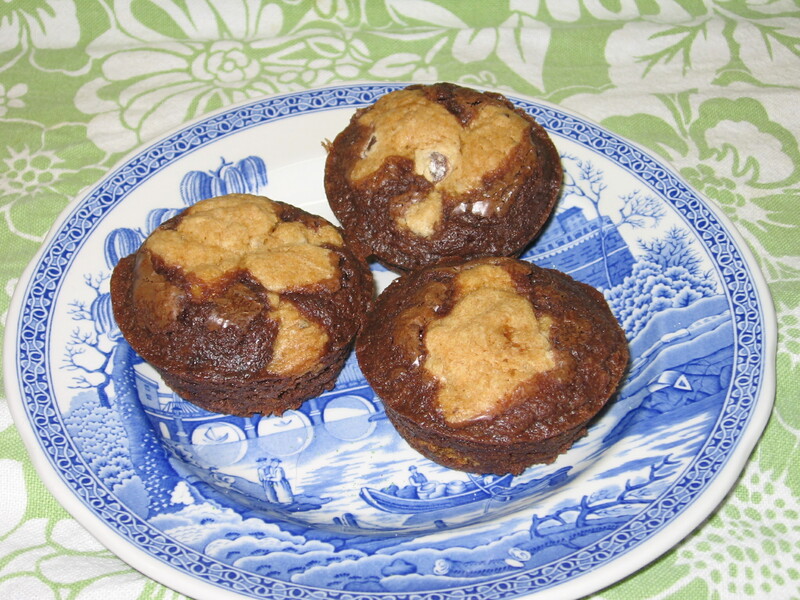 2- When finished baking, only cool Brookies slightly, then remove from muffin tin cups. The only down-side to Brookies is that they’re a little challenging to remove from the muffin tin in perfect condition. Of course, imperfect Brookies will still taste fabulous! Appearing Monday on Whimsical Words: a guest post from author, Alesha Escobar.